Posts have been rather scant lately and will probably remain so until after December. I am currently studying a dizzying array of procedural manuals for a test at work and, although they are extremely dull and I would much rather be writing here or working on my books, their analysis is consuming most of my free time. I will finish editing my second book after the test is over (I was nearly finished when I had to drop it for studying) and begin seeking publishing options sometime in the spring. I thought this 'mini-Jawa track looking vehicle' camera with Preditor'esque mirror camouflage was pretty awesome. It is similar in concept to the passive black-mirrored camouflage on the Venutian Witch in Europa ...The bears are just a bonus. I have tried not to hope. I have been critical of NASA. I have acted as though I really didn't care. But srsly, I really did care. I'm going to catch you up on the news but basically the bottom line is ... NASA can't take it back now. Also, I think it's appropriate that they bring it along in case they find somewhere to put it. 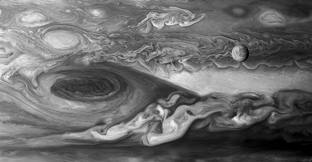 Jupiter, as you can imagine, has been the news a lot lately. Couple of things: you can see Jupiter without a telescope? Am I reading that right? Well, that's great news! Also, here's a couple of reasons why we're going, and for that matter, why you should look up once in awhile. And this is just a really cool map, a compilation if you will, of where all the water is in the solar system. You know, in case you've already built a space ship and you are interested in exploring. Or in case we run out of water and it's really efficient to go get some from some of these places. Or, better yet, we hit those places first as alternate living sites. Logic. What will they think of next? It's a new era. It's a jump-started old era. Pota(y)to, pota(h)to. Wouldn't you love to go to CU? I know I would. Later this week: a review and some pics of the Chicago ComicCon. I know San Diego is the bees-knees of cons but Chicago was the biggest one I've been to. Wicked cool. Chicago Comic Con is next week and I will be there signing books! I still have some 'BeAMantaFan' t-shirts left and I decided to give one to everyone who buys a book...until they are gone. So drop by and say hi, hallo, hej, hola or ko ni chi wa! I'm not sure how other small-time authors feel about book festivals but I don't like 'em. I'm sure the bigger ones have better traffic but since I haven't been to those, I don't know for sure. The book festival that I went to recently (look, there I am) had MAYBE 20 people walk through the doors as paying customers ALL DAY. From what I understand, the registration fee pays for some of the general expenses. In my humble opinion, a large part of the fee should go to advertising. Now, they have a website so I know there was some advertisement. Or maybe they made just enough to pay for the space but then why would you go through all that trouble of organizing and planning for what amounted to 20 people? I don't know. I had a similar experience with a book fair in Georgetown last year. Very little traffic. I appreciate the goal of a book festival/fair but if you truly want your message to get out there (and presumably that is that books = good and these authors = good), you need to advertise in the right places (schools? book stores? a visible sign on the building?). The bottom line: please don't have a book festival/fair just to say you are having one. I think potentially you could be burning bridges with authors and they may start telling their author friends and publishers and then no one will participate in your festival or fair in the future. Quality over quantity. That's my opinion. Wow - It's been a few weeks, hasn't it? It's your (bi-monthly) linkspam update. First, the bad news: SETI is (temporarily?) shutting down the use of their Alien Array Telescopes. The reason: budget. I'm not sure if it has more to do with the budget of the Hat Creek Observatory or SETI but the project has been shut down for now. The good news is tangential. I think the exploration of hostile places on Earth coupled with the interest to parlay that into space exploration is always good news. Practice here so we can go to Europa. Most importantly, any serious interest in Europa (and space exploration) makes NASA or ESA (hopefully) make space exploration generally and a trip to Europa specifically that much more possible. And speaking of interest in space exploration and Europa, did you know that there is still a space camp? Well, there is. And they like Europa too. I will be attending Comic Palooza in Houston on May 27th and 28th (Friday and Saturday only). I have not made it down to the southern half of Texas since Austin Comic Con...I'm looking forward to visiting Houston! It looks like NASA has presented the budget, and potential mission costs, in such a way as to send most of the board of decision makers into "sticker shock." This means that while they have listed the Europa Mission as PRIORITY #2, the cost is so high as to be prohibitive of approval. In these uncertain economic times, I am not - let me be clear - trying to advocate a bigger national debt in order to foot the bill for these missions. However, I have the distinct impression that the lack of budget will result in NASA just maintaining what they've got going on (which is??) and "maintenance" never got us very far. And while the missions above are unmanned, I would make the case that eventually (and preferably sooner) we're going to have to send actual humans. There is no substitution. "We should not abandon the achievements and technology of manned space exploration, accumulated over the past 50 years. We should build on them, and this will require that we keep planning and carrying out manned flights." And this is why we need to get our collective butts into space. Not only life but also a place to LIVE. As a reminder, I will be in Denton, Texas on April 16th for a book fair. Come one, come all! Sir Richard Branson is moving on to his next amazing project with the latest successful swim test of his new deep water submarine on March 28, 2011. He plans to take the boat to the five deepest ocean trenches in the world. The body style is an excellent design that seems to be gaining popularity (looks a bit like a 'Shark' in my book ; ) such as the Super Falcon 2 by Deep Flight. The video is well done and the music is great...If anyone happens to learn the name of the song a comment indicating the performer and title would be greatly appreciated.